Eyewear designer, Sandra Battistel, hails from north-east Italy and has worked in the fashion industry for more than 20 years. She met us for a cup of tea to talk about her design experience and plans for the future, and offer advice for others wanting to join the industry. Did you always want to be in fashion? I like art and design and think fashion has some relation to it – fashion is not necessarily art, but there is definitely a relationship there. Fashion is about the where and who is wearing the clothes – I think that’s what got me into fashion in the first place. People are normally spectators or participate in art differently. Fashion is totally different and that’s what I like. How did you get into eyewear? I studied museology and art exhibition – so a different field from eyewear design – but in a way there was still a relationship. It was very easy for me to get into eyewear because of the size of the business in Italy at the time. I sort of fell into it by accident, but I became very passionate about it. I quite like product design and wanted to get involved, so I worked as an unpaid intern at Marcolin for about a month – I believe they’re the third largest eyewear company worldwide. At the end of my internship, they offered me the position of junior design assistant to their creative director. It was a time where designs were starting to be made using software, whereas previously they were hand drawn. I had very good skills designing with computer software, so I was quite useful. Manufacturing was on site so I had the opportunity to see how things were made and speak to the people that made things. Everything was on site – marketing, manufacturing, design – and that’s why brands trust these companies with their product and put them in charge of their eyewear collections. From there I worked my way up in various other companies until I was head of design. As part of my job, I was in charge of some of the licensed brands for other companies – one of these brands was Vivienne Westwood. It wasn’t too difficult if you showed your passion, and had developed the right skills after some time. The industry – at that time in Italy – was open to training and developing their own designers in-house, so it was not difficult in that respect. It was less competitive in the mid-90s as well. People studied product design because they wanted to design cars and furniture – particularly in Italy. Maybe fewer people had aspirations to design eyewear and so, I think the competition wasn’t as fierce as it would be today. What attracted you to eyewear so much? I like to think about people that wear the eyewear and how it changes their look, and the important part it plays in people’s personality. I love shoes and handbags but the difference with eyewear is that it that goes on your face, and your face is the first thing that people look at. It’s important for me that people find – and wear – the right eyewear and they’re comfortable with it. 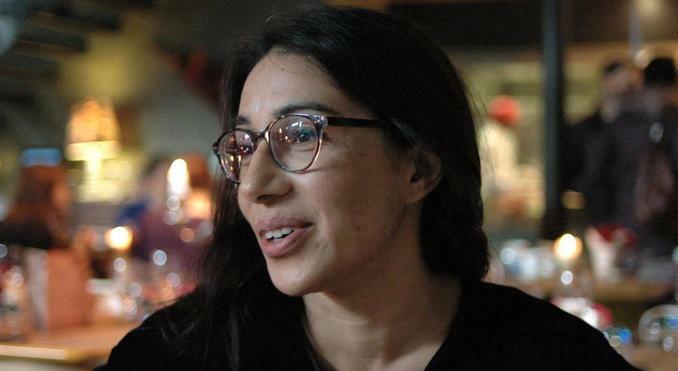 Read her top tips on adding eyewear to your line. The construction and materials are a lot more limited than with other accessories, so that’s a restriction. I’ve learned to see restrictions as a positive challenge. You have to think about what can you do with very little. It’s about making do with what you have and still being able to create something new and beautiful that people want to wear. 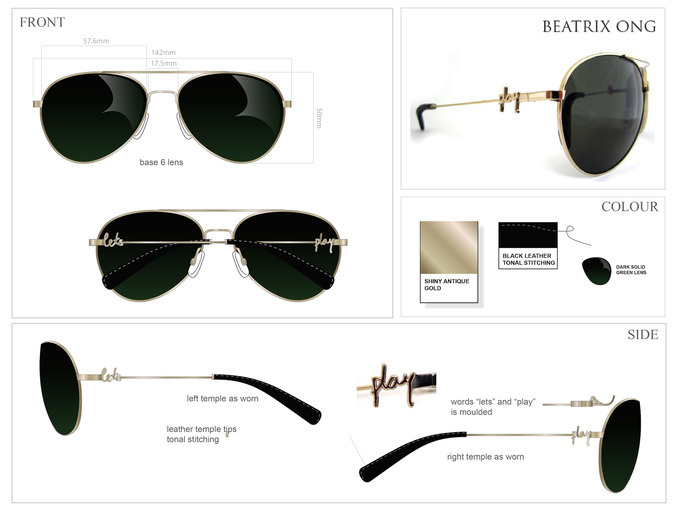 Once the designs have been put together you have to create a spec for a product, where you include the materials, the colours, the lenses, and the metal finishes, so it is ready to go to the sampling room and the production line. There are different phases, so you could be involved in a different phase depending on the time of the year or the project that you’re working on. There is also a fixed process – as there is with leather goods and ready-to-wear. You start from concept to design and then there’s product development, there’s a technical side to it as well. Are the constantly changing fashion trends affecting how you design? Trends influence your work because there may be a strong trend, for example, round glasses. You might want to follow the trend and develop it but also keep in the back of your mind that some people might just suit square frames. You have to create a narrative whereby the square fits into the round trend. It’s a love/hate relationship with trends. You can’t let trends 100% guide your work because you would be producing the same thing across the board, and you need to be able to offer a wider scope of products. How do you stay on top of the trends – what do you read and who do you follow for inspiration? I look at vintage a lot for inspiration, and I look at people a lot. I love to observe what people are wearing and sometimes I get really inspired by how someone on the street has interpreted glasses as part of their own look. A while ago I saw this girl that had styled her eyewear so beautifully: it fitted her features so well, but also her look. You could tell she had really made an effort, I found that very inspirational. I look at craft a lot too, new craft that merges new techniques, new production and new materials. You have to piece it all together and try to create a new beautiful product. You also host a blog, EyeSpectacle, tell us more about it. It is my way to engage with the end consumer directly. At the design studio I previously worked for, I would design for a brand or a customer, but not directly for an end customer as such. I would design a range for the brand, and then they take it from there once we’ve manufactured the frames and so forth; but they distribute it and they sell it. EyeSpectacle is that direct link between myself, my passion for eyewear and the end consumer. 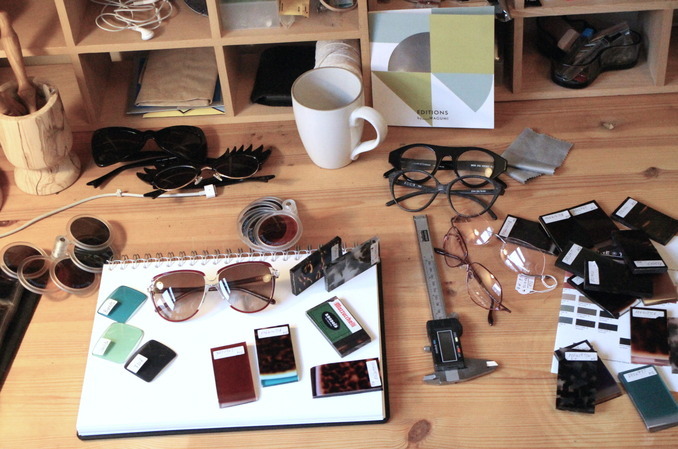 How do you manage your time as a blogger and eyewear designer? It’s not easy and you have to be very good at managing your time to give everything the amount of time that each project deserves. Of course, you will concentrate on some projects more than others, but you have to be very good and say ‘Ok, I’m doing this now’. Working with Tatty Devine was probably one of the nicest projects I’ve worked on. The team there are so free-spirited, open-minded and creative. Their approach is complete freedom when it comes to a new design, but for eyewear, they had to lean on someone with expertise to find a solution. This is because there are certain parameters of fit and comfort with eyewear that you need to take into account. They said ‘we want a pair of sunglasses that look like eyelashes’ – that was the brief. There were lots of versions of those sunglasses before we came to the end product – a lot of construction and engineering. You need to work out how this whole structure is going to hold together. That involves working very closely with the factory to work out a way they could manufacture the product. Is there anything that you’ve really wanted to design but you know would be very difficult structurally? Yes, I would like to be able to create a beautiful eyewear product that doesn’t leave a mark on the bridge of your nose. You can connect with Sandra Battistel via her Utelier Profile or her Blog.